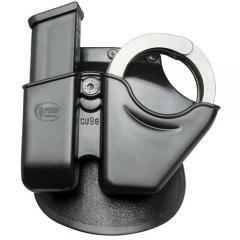 Unique Roto-Holster® system rotates 360° employing a forward or rearward cant. It doesn't want to stay locked down into my pants. Come lose and fell out several times Have to watch it close and check and push back down into pants. I love it, I did get my Smith and Wesson M-100's to fit just fine without any kind of modification. I have a Glock 21 and it fits the mag just fine too. Definitly like it alot.